Hey there! Thanks for dropping by Hacker on the run! Take a look around and grab the RSS feed to stay updated. See you around! We arrived in New York this morning – after a very early start to see the Verrazamo bridge we saw Manhattan drift past and the sunrise over Brooklyn. It made me think back to all the travellers who have made a similar journey in the last three hundred years and how the sight must have appeared to them – after days and days of just open sea the land looked magical and the buildings very exciting and alien. America feels like a land of freedom and opportunity from this perspective (relative to the confines of a boat). En route we saw some dolphins and whales and had a better time than I expected. There was plenty of time for contemplation and reflection, and I was able to make a decent start on my next game project. Anna is covering more on this in her blog, Without Wings. 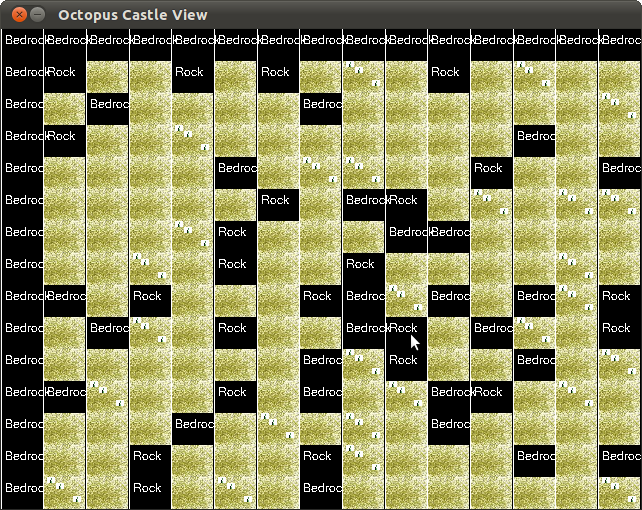 It doesn’t look like much at the moment (thanks to my “programmer art” skills) but my aim is to create a simple game where you play a Victorian in a mechanical octopus suit who is trying to mine gold/save the princess/whatever (as always in this kind of game, the backstory evolves organically once you’ve worked out the all-important gameplay). So far I have a grid with various terrain types, destructible tiles, actors that can move/fly around and follow simple lists of waypoints, and select/control functions now working. The game is going to mirror some of Dungeon Keeper’s gameplay with some new game elements and win conditions. The game would probably work quite well in multiplayer, but I need to get the engine basics up and running first before I split out any functions to client/server. The final version will be isometric 3d, but for the purposes of getting the engine up and running I’m currently using a 2d renderer with an isometric view built into the sprites (my little laptop is not very fast at all). The advantage to this approach is that it should be relatively easy to port this game to mobile platforms, should the need become apparent – when I get access to a machine with some larger horsepower I can write a 3d renderer, physics code etc. relatively easily without having to change the game code too much. At the moment I am using C# and the Tao framework to bind to SDL, but I have been running into performance issues already (more optimisation to be done, of course). I think it should be easy to port the infant game over into a java environment with some simple find/replace operations if the need arises.